It's that time of year again. The pollen levels are at an all-time high. You want to have your windows open but the fresh air leaves you stuffed up, sniffling, and itching. It's allergy season and your eyes are sure to notice, especially if you're a contact lens wearer. The most common complaint I hear around this time of year is "My eyes are itchy and I can't wait to take my contact lenses out at the end of the day." Or maybe your eyes don't itch, but they look red and irritated lately. Either way, you're likely suffering from ocular allergies, which are made worse by contact lens wear. Luckily, there are a few easy things you can do to alleviate that discomfort. 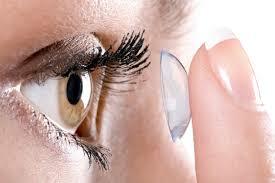 First of all, if you wear contact lenses, seriously consider having a contact lens evaluation with your eye doctor. If you're wearing a two-week or monthly lens, allergens are accumulating on your lenses and making matters worse. Consider switching to a daily disposable contact lens so you get a fresh pair of lenses every day. That eliminates the possibility of allergens and other irritants sticking around on your lenses for days or weeks at a time. Believe me, daily disposable lenses are a game changer for allergy sufferers; I, at one point, was out of my contact lenses for two weeks because of allergies. It wasn't until I switched to daily disposables that I found any relief and was able to start wearing my contact lenses regularly again. In addition to switching contact lens modality, and for those who don't wear contact lenses, consider using an over-the-counter topical antihistamine. These are available at basically every pharmacy and can provide immediate relief from itching and irritation. 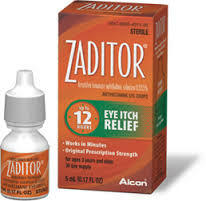 I recommend Zaditor or Alaway, both of which are to be used twice daily, but you can often times get away with just once daily depending on the severity of your symptoms. These drops are to be used without contact lenses, so put them in right away in the morning and in the evening after removing your contacts. You may also consider performing a cool compress a couple times a day. Just use a cool, damp wash cloth or a refrigerated eye mask to provide cooling relief to your eyes and eyelids. I recommend 5-10 minutes at a time, at least two times daily. It's nice and relaxing... enjoy it! One last thing to keep in mind: if you're taking an oral antihistamine, you may actually be causing more problems for your eyes than you think. Oral antihistamines have a tendency to dry your eyes out and subsequently cause symptoms to worsen. Only use an oral antihistamine if you truly have systemic allergies, not just to alleviate ocular symptoms; that's what the drops are for! I hope you find this helpful, and I hope you find relief from those allergies! I know how you're feeling; I was in your position several years ago. That was before I switched to daily disposable contact lenses and started using a topical antihistamine - now I feel like a new person during allergy season! And I am confident you will too if you follow my regimen above. Happy spring! Summer's Here! Are You Protecting Your Eyes? Contact Lenses: Do You Know What You're Missing?